Home » Election Analysis & Results » Why is Quintanilla Telling His Supporters to "Trash" Veasey Signs? For other candidates with virtually no chance of winning, a call to supporters to vandalize yard signs might be seen as late campaign desperation and frustration. For Carlos Quintanilla, however, it is a particularly irresponsible and self-destructive move. Carlos Quintanilla has a long and ongoing record of legal violations while living in Texas. In fact, there may be current outstanding warrants for his arrest in Dallas County due to his failure to pay traffic violations. Even more damaging, however, is Quintanilla’s felony record when he lived in the State of Illinois, where he was found guilty of a series of violations including a conspiracy to violate RICO - Racketeer Influenced and Corrupt Organizations. 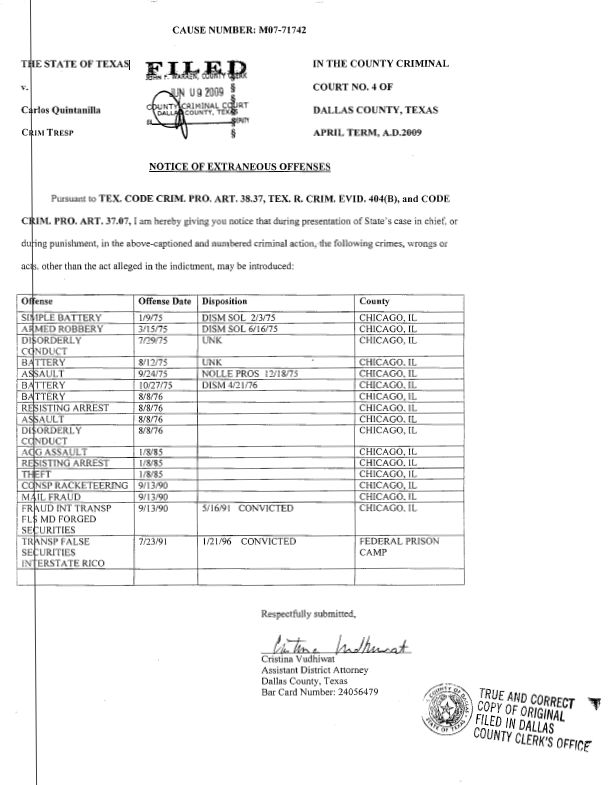 The official document below lays out a damning record of Carlos Quintanilla's criminal charges. Interestingly, Quintinilla’s felony violation prohibits him from holding state or local office in Texas. He is eligible for Congress only because the state restriction does not apply to federal office. The Dallas Morning News posted a glowing endorsement of Congressman Marc Veasey, saying in part, "Marc Veasey knows the issues most important to his Fort Worth and Dallas constituents. And he now has enough experience in Washington to effectively work in their best interests." "Carlos Quintanilla’s irresponsible message promoting vandalism and his history of criminal violations puts an exclamation point on the Dallas Morning News' endorsement of Congressman Veasey."